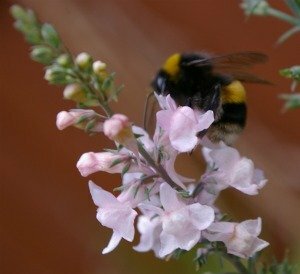 List Of Over 30 Fantastic Garden Flowers For Bees! Here are over 30 fantastic garden flowers for bees (it was originally 30 - but I keep adding flowers to it!). 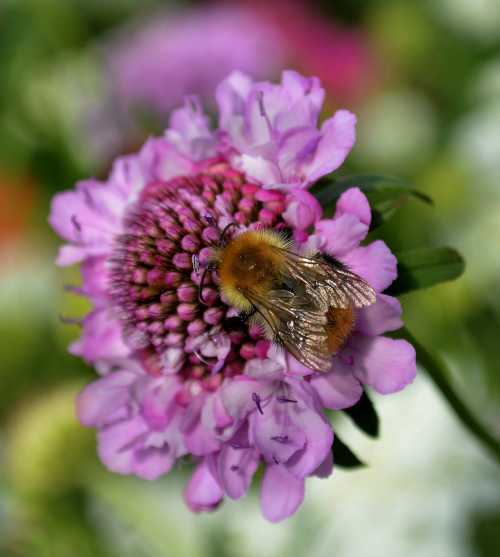 Of course, if you want to choose plants for pollinators, the potential list of flowers, shrubs and trees you could include in your garden is endless, but I have selected some of my favourite garden flowers for their appeal to bees as well as their beauty and value in the garden. Whilst there are many wildflowers of tremendous value (- not least, the dandelion and some of my other favourites, such as bird's foot trefoil!) they are not included here - I have a separate page for them, and another featuring herbs (although there are one or two herbs on this page too). 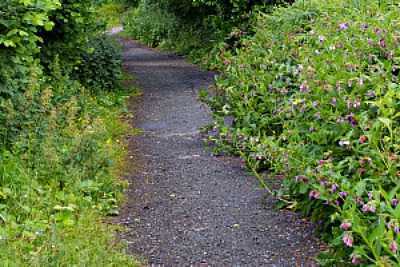 I also have separate pages for shrubs, trees and hedgerows and wildflowers as well as drought tolerant plants. A wonderful, aromatic bee plant and herb, and the leaves are sometimes used to make a tea, or eaten in salads. This is a herbaceous perennial and comes from the mint family. Provide well drained soil and ensure it has full sun. You can start this plant with seeds, and divide the clumps in spring when established to plant elsewhere around the garden, or share with friends. Try wonderful, tall growing allium bulbs if you haven't already! They provide nectar and pollen for bees in the summer. Wonderful in the border - some varieties look okay in pots. Often overlooked and forgotten, this lovely cottage garden annual has beautiful, scented flowers. It is long flowering, and easy to grow from seeds sown April to May. Bees love it! 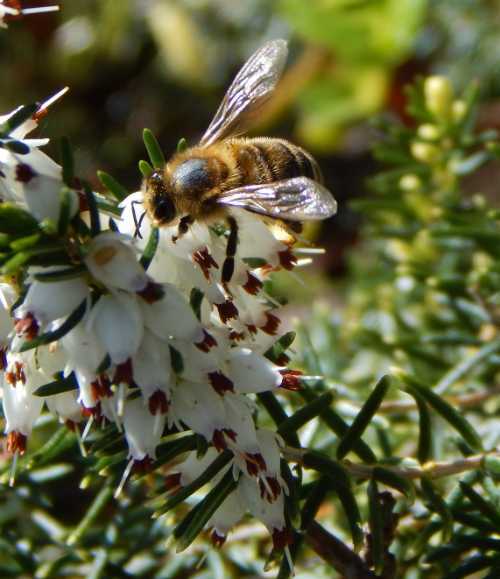 We have winter flowering heathers which provide early food for honey bees and bumblebees. Excellent in a rockery. 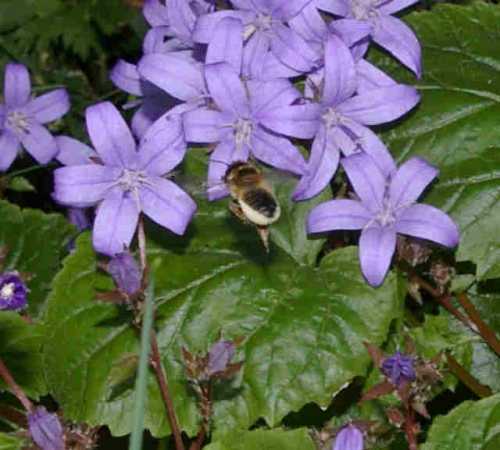 There are different varieties of campanula, all fantastic for bees. I used to have the tall ‘Canterbury bells’ – and I recommend it as a good old-fashioned cottage garden flower for bees, but currently I have only 2 varieties of low-growing bedding campanula in my garden, and they are loved by solitary bees - especially leafcutter bees (pictured above) and bumblebees. Great in the rockery – these plants flower for ages from May onwards. A wonderful perennial and source of food for bees from April onwards. I love the silvery leaves and bees love the flowers! Gorgeous, tall annual flowers on wonderful stems with feathery leaves. An absolute favourite with bees! Sow them in seed trays in compost during Feb – March under cover, and transplant them into the flower border when danger of frost has passed, or sow them directly into the ground where they are to flower. Go for the Cosmos bipinnatus. This lovely plant has aromatic foliage - a bit like lavender. You can take cuttings of this plants in order to propogate more specimens for your garden or share with neighbours. Allow this tall vegetable plant to flower - it will be covered in appreciative bees! Watch with delight as bumblebees crawl inside the gullet-type blossoms! In my experience, these are happy in partial shade, where they are still visited by bumblebees – and then help brighten up a shady corner. I have the biennials, but apparently it is possible to get them as a short-lived perennial. I can’t say this is the best or most efficient way to plant foxglove, but I simply threw the seeds into an informal part of my garden, and was fortunate that some plants came up! Flowers from late May or June onwards, and long flowering. Fantastic, low growing evergreen perennial, perfect for those dry spots in the garden, and sandy soils. Once a number are in full bloom, one day you’ll notice many bees foraging on the open flowers. Bumblebees are especially keen. Will tolerate a little shade, but prefers full sunshine to attract plenty of bees. A wonderful cottage garden favourite! Look for the traditional, scented varieties - and I prefer taller stems rather than cultivated dwarf varieties. Bees and butterflies love them! Wallflowers are tolerant of poor soils too - or even little soil! I often see them growing out of old stone walls close to where I live! Give them full sun, although they will tolerate some light shade. It's often described as a short lived perennial or biennial. Sow seeds from June to produce plants that can be bedded out in August/early autumn. You should see flowers the following spring. 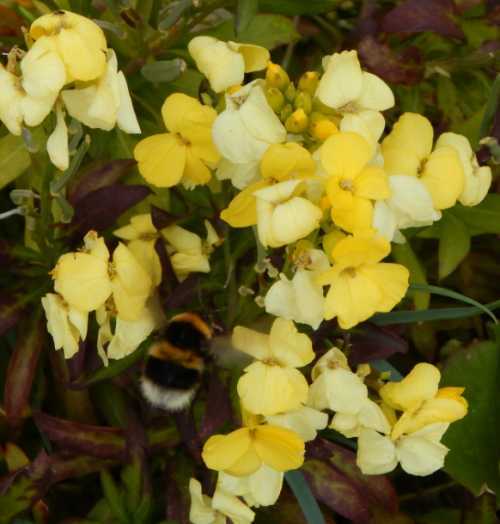 Plant them in a drift for a lovely, scented display buzzing with bees! This plant grows wild in the local landscape where I live, and I know people who do indeed grow it in their gardens - and bees love it. It may be one I'll add to my garden in the future. It can grow in well drained soil, and it's great for sandy soil and dry conditions – if you live in a coastal area, this could be perfect for your garden. Plant it in full sun, and watch the bees land on it from June onwards. Once the flowers are passed their best you can cut the stems, allow them to dry out, and spray they with silver or gold paint, ready to use in Christmas vases or the door wreath. 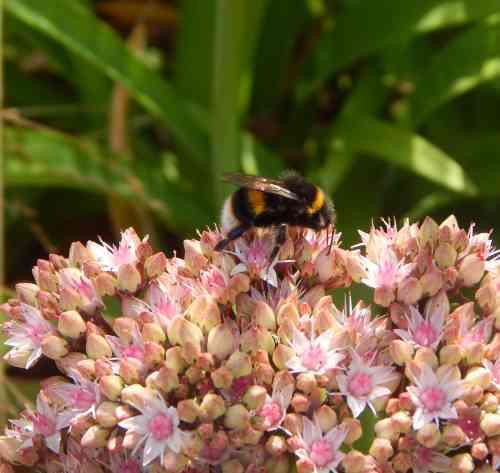 One of my favourite garden flowers for bees! 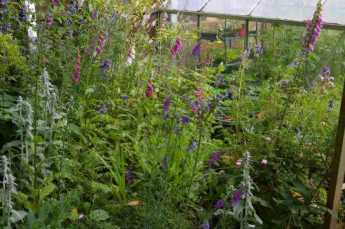 A fab herbaceous perennial visited by many bee species. Lovely open flowers from May onwards. Different varieties will help you extend the season. I have a purple one (a variety I think is called 'Brookside'), which blooms first (end May/beginning June onwards), and this one above, which blooms about 2 weeks later. I have a few smaller varieties of geranium too - one of them I think is Geranium sanguineum ALAN BLOOM 'Bloger'. 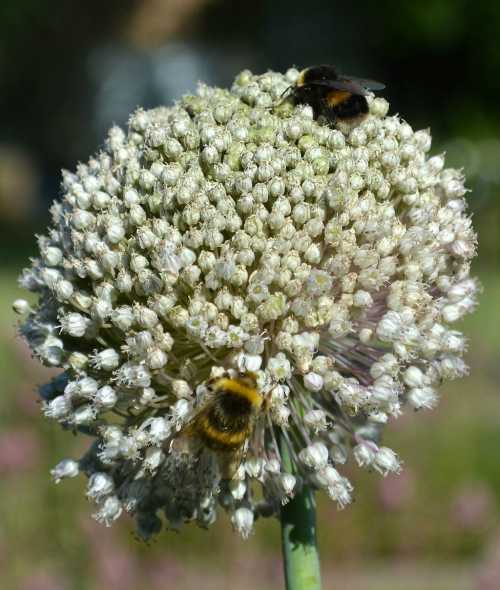 Lovely tall perennials attractive to honey bees, bumble bees and solitary species. Give them full sun. Gorgeoous in the border. Pollinators are attracted to this pretty flower. Lots of lovely, bright shades of oranges and pinks available, and the flower itself is good for drying, and can be used in dried floral arrangements. In my experience, this can take a little time to establish itself and flower, but the wait is worth it. I originally grew this in our small pond, but it now occupies a place in the border. It's rather tall. 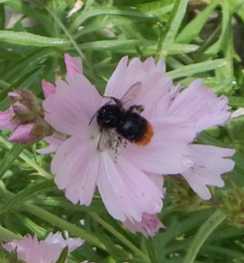 My most common visitors are bumblebees and solitary bees. 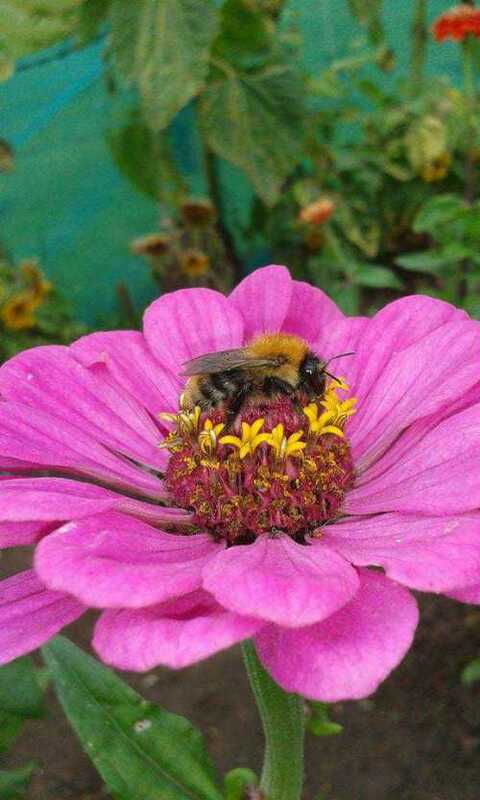 Another of my favourite garden flowers for bees! Flowers from late May or June onwards, and long, long flowering -especially if you cut the stems before they go to seed - they will then throw up more stems of flowers, hence extending the foraging opportunity for bees. A lovely, tall flower with spikes of pale pink or purple flowers. I love to watch bumblebees and solitary bees make their way up the stem. Very, very easy to grow from seed, and self seeds easily (plants can easily be transplanted or simply pulled out and given to friends if you don’t want them - they may wilt for a while when transplanted, but water well, and they'll recover by showing new growth). A bee garden without lavender is hard to imagine! 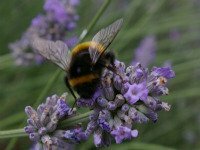 Indeed, lavender is one of the best herbs for attracting bees. Plenty of varieties to select from to ensure the longest display possible. Spoil yourself too, by planting it close to a seating area so you can enjoy the fragrance whilst you listen to the bees buzzing! Fantastic herbaceous perennial and cottage garden favourite. Bumblebees in particular, love the flag blossoms. Protect them from slugs using a soil garlic drench, not slug pellets. 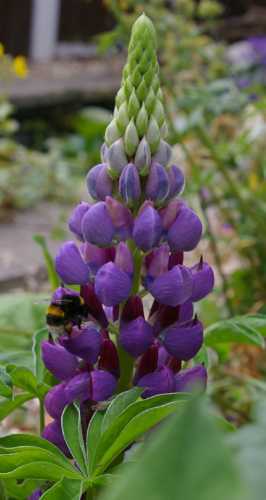 Read more about lupins. Lovely tall flowers and a superb flowering plant, Monarda is attractive to bees (and hummingbirds if you live in the right part of the world!). Mine is currently planted in a sunny spot, which receives very light shade later in the afternoon. 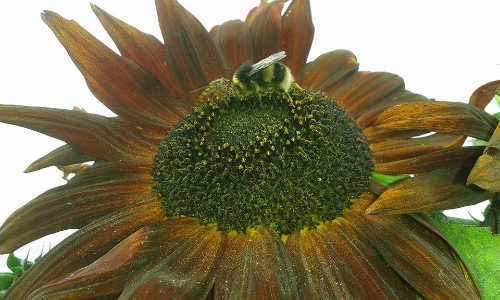 Leave a reasonable amount of space between plants as they can be prone to powdery mildew, hence if powdery mildew is a common problem in your garden, you may wish to try flowering plants for bees which are less susceptible. Providing a source of food from Spring onwards. 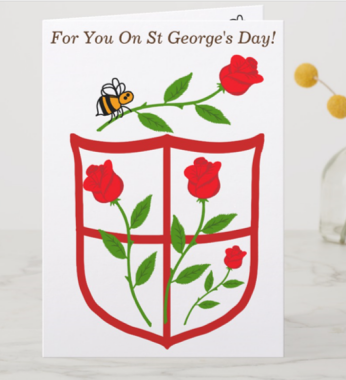 I especially like the Opium poppy for bees. 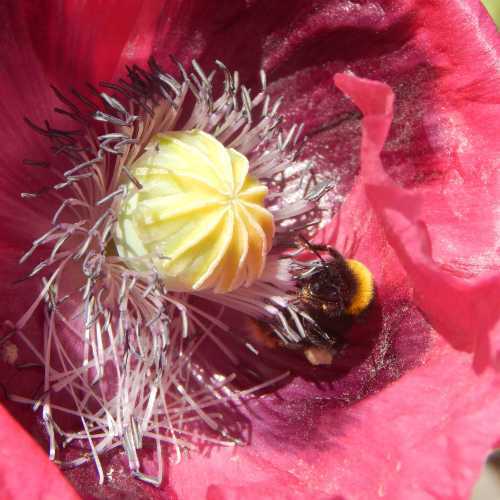 Again, honey bees, solitary bees and bumblebees enjoy foraging on the pollen loaded anthers. 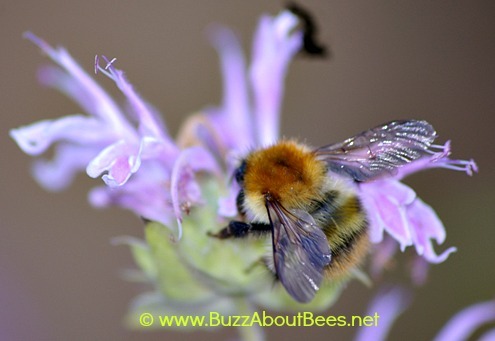 Bumblebees can be heard vibrating their bodies against the anthers to release the pollen. Poppies need a sunny spot and will flower from May/June onwards. Well known as a bee magnet, and very easy to grow from seed. 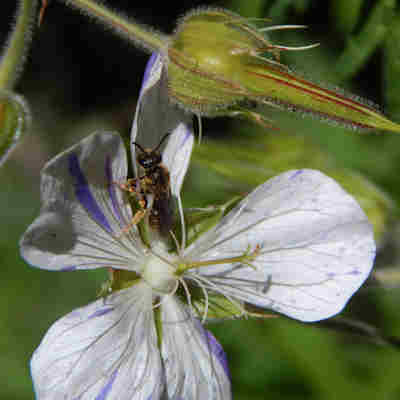 You can sprinkle Phacelia seeds thinly on a prepared seed bed where they are to flower. 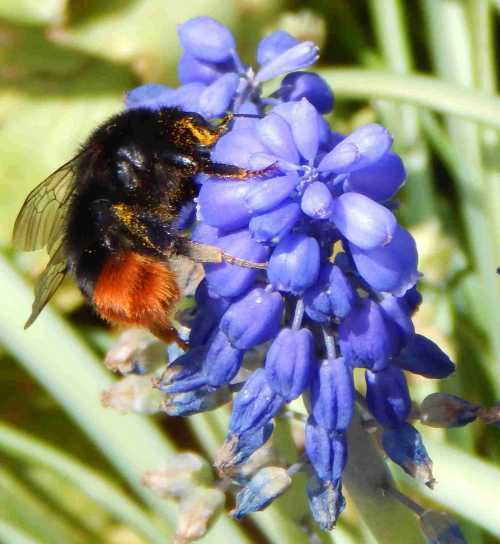 You’ll be rewarded with lovely blue flowers for bees, and the happy buzzing sound of furry pollinators! A must have for bees, providing early food when little else is available and they are desperate to gain their protein from pollen. 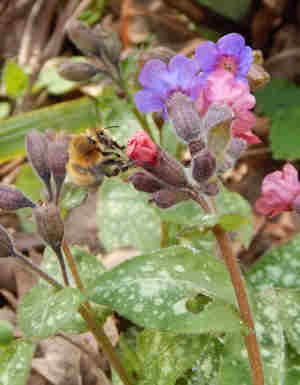 Pulmonaria produces flowers anywhere between January and May, depending on your location. 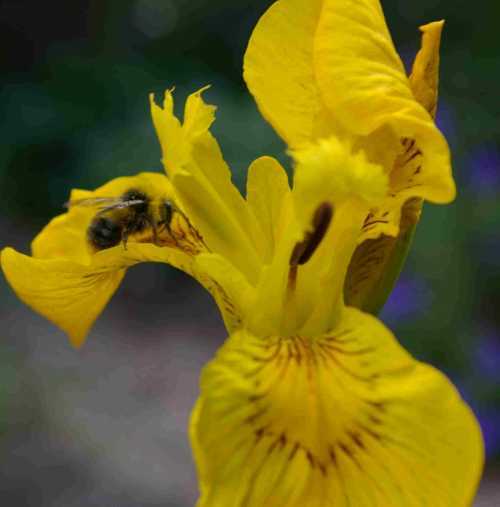 Bumblebees, honey bees and solitary bees – especially the hairy footed flower bee, will be very grateful! Evergreen perennial, the pinky-blue flowers are accompanied by speckled leaves. A magnet for bees and butterflies. I especially like the pastel pinks and blues. Grow it in full sun. Lovely flowers in the summer. 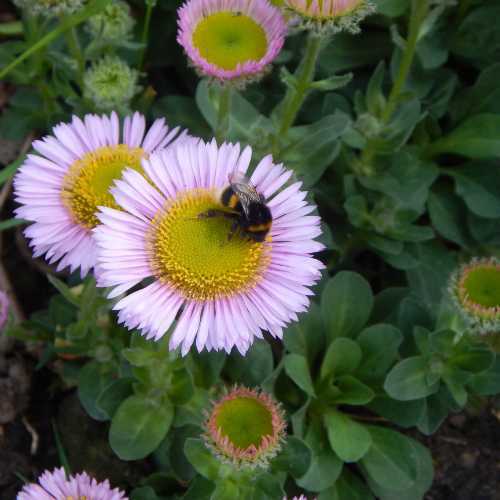 Provides lots of nectar for honey bees, bumblebees and solitary bees from late summer onwards. Easy to grow succulent. Sunshine is best, although I have a patch which is in light shade at least for some of the day. Great for dry soil locations. Mallows are great for bees of many species, and they look lovely in the border. Pictured above is Prairie Mallow, Sidalcea ‘Elsie Heugh’. 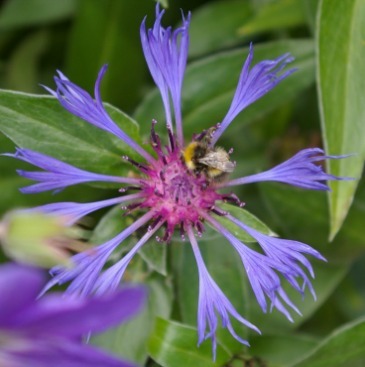 A magnet for bees, this lovely plant has lovely long stems of flowers that are sturdy, and don't need staking. You can read more about this very pretty flowering plant here. 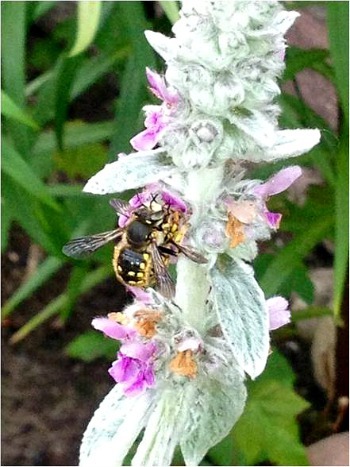 Absolutely fantastic flowering plant for bees, hoverflies and sweet little beetles! My big regret is that when I last tried to photograph lots of bees on a solidago patch near my house, the batteries in my camera were quickly exhausted. I did manage to take some piccies a short while later, but I felt I had missed a better opportunity before. 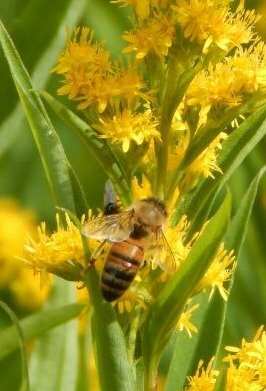 Honey bees, solitary bees of many types and bumblebees absolutely love Solidago. Yellow flowers from summer through to early autumn. 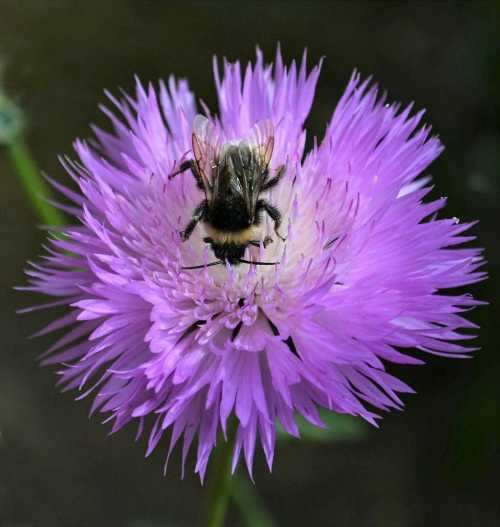 Providing nectar from delicate pinkish flowers on spikey stems, the flowers are especially helpful for wool carder bees, and if you are lucky, you will observe them collecting some of the hairs from the leaves for the building of their nests. Also popular with bumblebees and other solitary bees. Flowers from late May/June onwards, and long flowering. Go for the perennial variety and plant it in full sun. Who can resist sunflowers? 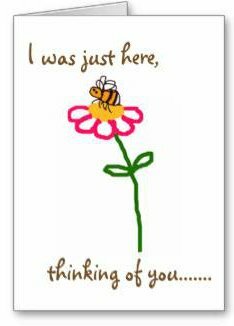 Well the bees can’t! So many varieties to choose from! I prefer the tall varieties. Remember you may need to support the stems! So easy to grow, this plant rambles along the ground nicely, producing an abundance of flowers ranging from sunshine yellow and orange to deep rusts and reds. I recommend the traditional, orange and orangey-red colours. 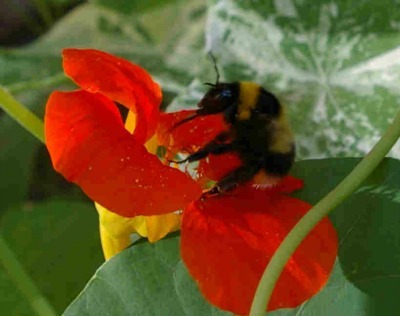 Long tongued bumblebees, such as Bombus hortorum, are especially partial to the nasturtium flower! The flowers are also edible for humans, of course, and each plant pops out so many flowers, I’m sure the bees won’t mind if you snaffle a few! They spread rapidly, or you can train them to climb. Just give them plenty of space. One of my favourites, as it adds both height and softness to a border, with its slender stems and flowers at the top. I recommend this perennial, and if bees could cast votes, I reckon they would vote for this one too! Flowers from summer through to autumn, and loved by bees, butterflies and other pollinators. You can get seeds from Amazon USA and Amazon UK. 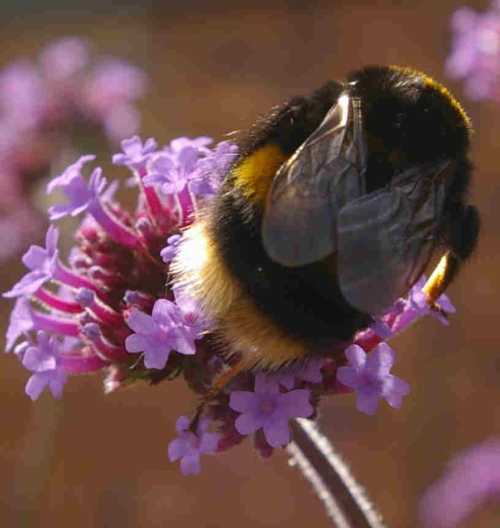 Fabulous garden flowers for bees, and loved by other pollinators too. Stunning in the flower border, and an abundance of colours available – from deep jewelled pinks and reds to amazing acid green and rusty orange. Irresistible! Why are hedgerows, trees and shrubs so valuable for bees? 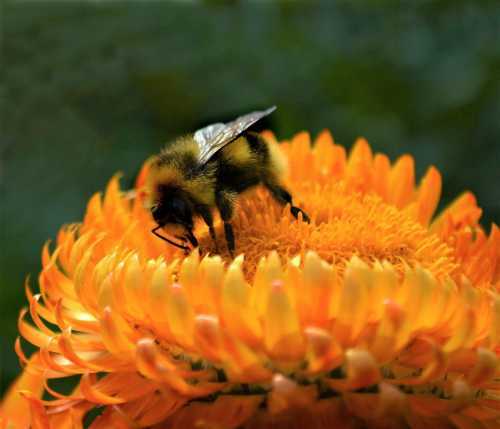 From lawns, to bee houses and flower shapes, turn your garden into bee heaven!